Cultivate an intentional marriage with these practical tips. An intentional marriage is not always talked about as much as intentional parenting, however it is just as important! Many times we put all of our energy and focus into our children and neglect the marital relationship. I am most certainly not a marriage expert. In fact, I think I am in the trenches, learning just like the rest of you, but as I learn things I cannot just keep these gems to myself. Whenever I am struggling, I reach for the advice and encouragement from others. 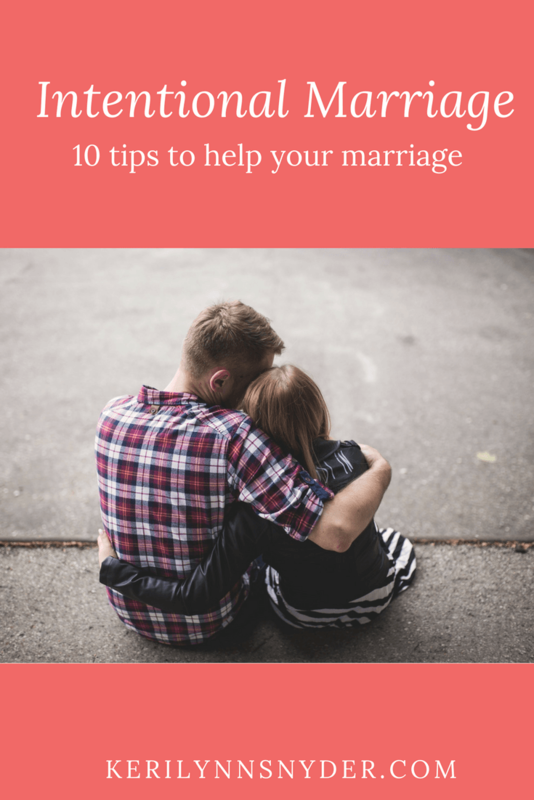 So right now, I want to offer to you ten tips for an intentional marriage. While I could go on and on with this subject, I will save more for later. For now, imagine we were sitting at the local coffee shop, steamy mugs in hand and chatting face to face about the glorious gift of marriage. It is such a struggle to let go of control. I want to know what will happen, when it will happen, and how it will happen. Over the past couple years, I would like to think that I have learned to let go of control more but it is still very much a struggle. I am seeing how vital it is to encourage my husband in his role as the leader of our home. In trusting him, I can sit back and trust that he is following God. It is so hard at times because we tend to think we know best, don’t we ladies? Trust me, friends, save yourself some time and let go of the control. Avoid the pitfall of comparison. With lives on complete display via social media it can be hard not to struggle with comparing your life to the life of someone else. Whenever I am on social media, I try to remember that social media is just a small glimpse of someone’s life. Perhaps you see the lovely bouquet of flowers on your friend’s Instagram feed and start to compare and wish but maybe what you don’t see is the fight that happened the night before. Close the social media feed when comparison creeps in and remind yourself of what is good in your life. We all have different lives and our spouses have different jobs- life is going to look different for everyone. Embrace what you have and focus on enjoying it! Since having baby #3 a little over three years ago I feel like dates have become even more important in our marriage. I absolutely adore these times of one on one with my husband. Now before you say you cannot go on dates because of lack of funds or babysitter, stop and listen. You can still date your spouse… at home! My favorite dates are when we put the kids to bed and enjoy dinner together. It is always so relaxing being home and having real conversation without the interruptions of kids. The point of dating your spouse is to have one on one time, location is not important. One of the main reasons for arguments is a lack of communication. We make assumptions and have expectations and get angry when things go a different way. I know how busy life gets and how hard it can be to carve out time to communicate, but it is vital. While this can seem so simple, it can be hard to keep priorities in check; especially as kids are added to the equation. These past few years, I have been learning more than ever to keep God first. I fail a lot, but there is always grace. When I am seeking God, everything else just falls into place. There are trials, there is brokenness, but through it all there is a peace that covers all. If you want to improve your marriage, I challenge you to start first with your relationship with God- spend time with Him and see what happens. A couple years ago, my husband was in grad school. It took two years and he continued to teach middle school as he went to school himself. I gave birth to our third baby his final year of grad school. There were some really hard moments and yet he constantly kept his family a priority. There were many late nights for him as he would finish school work after the kids were asleep. One thing I learned during this season was to cheer him on through it. Don’t forget to cheer your husbands on friends. 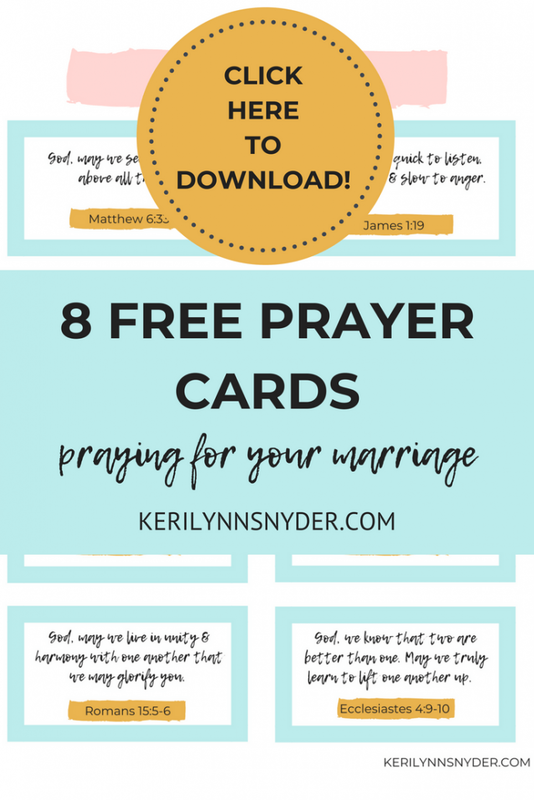 It is imperative that they are hearing the positive and uplifting words from their wives. Let go of the nagging, you are his wife- not his mom! I do not even like the word nagging, but we all struggle with this one. It is such a hard one to tackle as many times it sneaks in without us realizing it. I have realized that the more aware I am of it, the more easily I can spot my nagging words and choose other ones. Show grace and choose your words wisely. Encourage your husband in his friendships/hobbies. My husband is always encouraging me as a writer and in carving out time for my friendships. Both things are very important and feed my soul and he knows this and encourages me to do these things. At the same time, I have realized that I need to encourage him to do things that he likes and to take time for himself. This may seem a little silly but hear me out. We love watching seasons of shows together in the evenings. I think we have watched all of the Office about three times now and we are currently finishing up a second round of Parks and Recreation. I know some people do not get it and may even say that it is bad to watch TV as a couple, but I think it is wonderful and it is our thing. We talk and laugh about the shows and it is such a good time of connection with each other after a long day of work/parenting. Many times we will pause the show to share something more from our days. Figure out your thing as a couple and embrace it, protect it, and savor it. I never want to get to the point where we are strangers and loose the laughter. Make it a point to laugh together and have fun. Whether it is watching a comedy with each other, sharing a funny story from your day, whatever it is- have fun together. Life is full of hard moments but at the end of it all, I want to look back and see joy that was present. Fight for your marriage, friend. There will be beautiful seasons and there will be really hard seasons, but the amazing thing is the growth that can come from the hard seasons. If you are in the middle of a really challenging season, I urge you to hold on. You will come out of it and be overfilled with so much gratitude and joy. If you are in the middle of a really blissful season, I urge you to keep growing. The lovely seasons are when we can build the foundation that we stand on in the hard times.